The following audio examples were recorded with drummer Ant Fox in the Colin Hill Recital Room at Cambridge's Hills Road Sixth Form College. The instrument used was an Orange County 14x5-inch maple snare with Remo Ambassador coated heads, captured within the context of a full-drumkit performance. The microphones used were Shure SM57 cardioid dynamic mics, kindly loaned by UK equipment rental company FX Rentals, which were preamplified via the mic preamps of a Tascam DM3200 digital mixer and recorded digitally without any signal processing. Many thanks to the college's Director of Music, Jonathan Sanders, for the use of the recital room and its adjoining control room, and also to Geoff Smith, Dan Jeffries and Tom Adams for their assistance with the sessions. This microphone setup used five Shure SM57 cardioid dynamic microphones over the top rim of the drum. All five mics were recorded simultaneously, but to allow easier comparisons I'll present the mic signals in smaller groups, each with its own diagram and audio-files table. A stereo overhead pair of Shure KSM141 small-diaphragm condenser microphones were also recorded alongside for context. Miking Distance: These examples show how miking distance affects the timbre captured when the microphones are aimed at the same spot on the drum head. 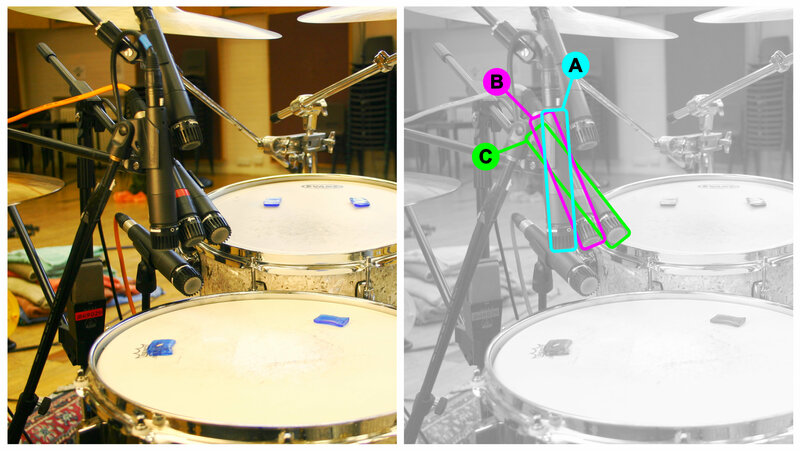 Miking Angle: These examples show how, for a given miking location, altering the miking angle to point at different areas of the drum head affects the recorded snare tone. This microphone setup used two Shure SM57 cardioid dynamic microphones around 10cm from the top and bottom rims of the drum respectively, both pointing midway between the centre and edge of the drum head. 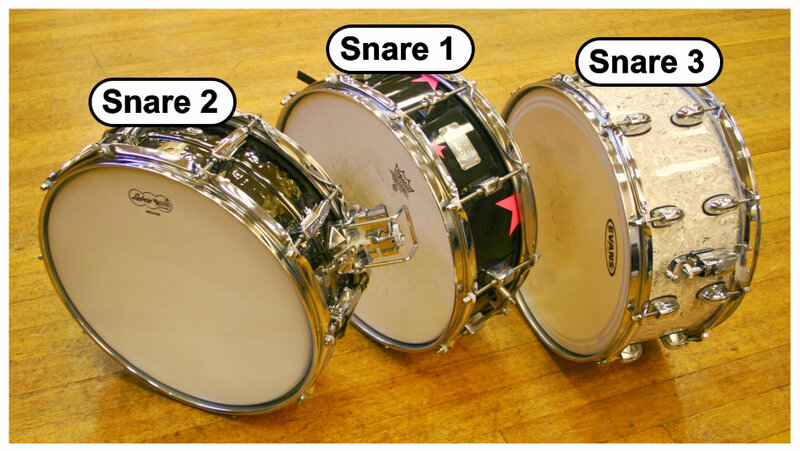 Above & Below Three Different Drums: These examples show the difference in sound between the upper and lower heads of three different snare drums from typical close-miking positions above and below the drum. The three drums were an Orange County 14x5-inch maple snare ('Snare 1'), a Ludwig Black Beauty 14x5-inch hammered brass snare ('Snare 2') and a deeper Gretsch 14x6.5-inch mahogany snare ('Snare 3'). A WAV/MP3 WAV/MP3 WAV/MP3 Shure SM57 cardioid dynamic microphone around 10cm above the top rim of the drum, pointing upwards to a spot midway between the centre and edge of the drum head. B WAV/MP3 WAV/MP3 WAV/MP3 Shure SM57 cardioid dynamic microphone around 10cm below the bottom rim of the drum, pointing upwards to a spot midway between the centre and edge of the drum head. To read more about recording snare drum, check out this Sound On Sound magazine article, to which the above audio examples directly relate. 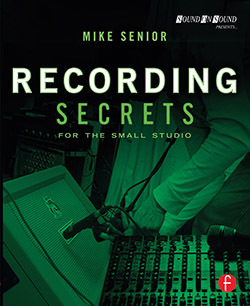 The article also includes a shootout of three different snares and a number of famous snare-drum recording microphones.